Representing the company’s first foray into the premium CT market, Samsung introduced the NExCT7 CT scanner at RSNA 2015. The company had previously acquired Neurologica, a provider of the portable BodyTom and CereTom CT scanners in January 2013. According to the company, the US FDA 510(k) pending NExCT7 features has a 128-slice configuration, 78 cm bore and a rotation speed of 2.5 seconds. The small footprint CT system has a table that can accommodate up to 660 lbs. (300 kg.) and has an ECG plug-in. Additional features include S-Recon for motion correction and the ability to acquire 30 ms., temporal resolution. Patients with high heart rates can also be imaged, reportedly up to 125 bpm. In ultrasound, the RS80A with Prestige is now available in the US. The system offers several advanced technical capabilities, including: S-Fusion for simultaneous localization of lesions with real-time ultrasound supported by other modalities’ 3D data sets; S-Shearwave, which help detect the velocity of the shearwave transmitted through the targeted lesion and display the numerical measurement of stiffness; E-Breast, a tool for breast lesion exams that calculates the strain between the area of the suspected lesion (ROI) and normal breast fat and displays the results; and E-Thyroid, designed to assist with the diagnosis of thyroid lesions by providing the contrast of an elastogram. 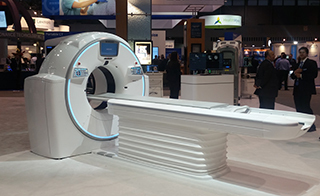 RSNA 2015: New Premium Imaging Systems Introduced by Samsung. Appl Radiol.